Sculpture commissioned by GlaxoSmithKline honours Steven King's contribution to the Tasmanian Poppy Industry and pays tribute to all who have advanced and pioneered the industry in Tasmania. The poppy industry was introduced to Tasmania in the late 1960s by the Edinburgh based company, Macfarlan Smith, a subsidiary of Glaxo. Macfarlan Smith had been doing trial work in the UK aimed at establishing the industry in that country, but finally recognised that the unreliable English summer was not suitable for poppy production. Their researcher, Mr Steven King, examined weather records for several countries and came to Australia with a view to establishing the industry in Victoria. The Victorian government was not interested in the proposal, and Mr King turned his attention to Tasmania, a location which he had previously overlooked due to not having climate data. 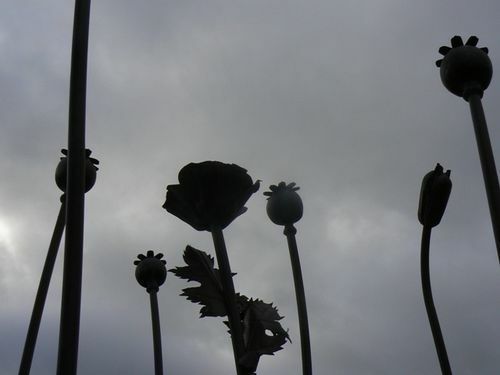 He found the Tasmanian Department of Agriculture a willing partner in establishing trials, and over several years Tasmania was confirmed as a suitable location for poppy cultivation. This memorial celebrates the pioneer of the poppy growing industry in Tasmania, Stephen King. King’s important role in the Industry’s success was recognised in 1979 with an OBE for services in the development of the oil poppy industry. We recognise all who have pioneered and advanced our unique Tasmanian Poppy Industry, including growers, contractors, government agencies and staff of Tasmanian Alkaloids and GlaxoSmithKline.